Anthony and Erica Lazzaro of Moreland Hills love living in Jewish Cleveland. 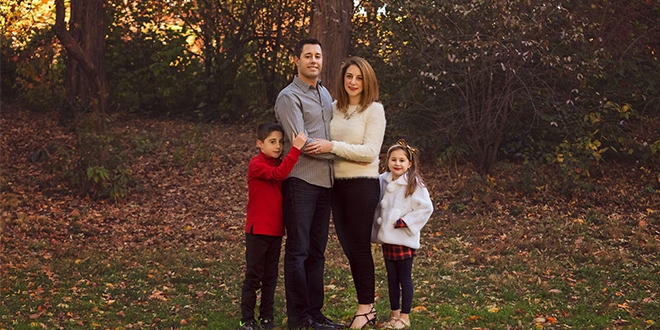 Along with spending time in the community as members of Park Synagogue and as a Gross Schechter Day School family, the Lazzaros enjoy the Cleveland Metroparks and snacking on the many choices of ice cream around the city with their children. Q - How do you incorporate PJ Library in your home? It is always an exciting day when a PJ Library book is in the mailbox! The program has provided our family with a collection of high-quality Jewish books, including many about holidays not usually covered in other Jewish children's books. Our 8-year-old is also excited to take part in the PJ Our Way program; he looks forward to being involved in his book selection. Q - What do you enjoy about living in Jewish Cleveland? The Cleveland Jewish community is like no other. We have made connections with families and community members through our involvement in our children’s school, Gross Schechter Day School, our membership at Park Synagogue, and activities with the Jewish Federation of Cleveland. It allows our family to feel we have an important and contributing role. Q – What are your favorite things to do as a family in the city? We enjoy taking advantage of the Metroparks, especially South Chagrin Reservation. We also spend time at the Cleveland Museum of Art, checking out new restaurants, and eating the many choices of ice cream…so much ice cream! For more information on PJ Library and the Young Family Engagement Team, please contact Aviva Roland at 216-593-2926 or aroland@jcfcleve.org. In partnership with the Jewish Federation of Cleveland and the Harold Grinspoon Foundation, PJ Library® in Cleveland is generously funded by Mort (of blessed memory) and Iris November in celebration of Debra Ann November's life.